Conference Centers in Greece combine with the country's rich cultural heritage, the unique natural environment, the thousands of islands with mild climate year-round and the continuous improvement of its infrastructures making it an ideal destination for the international congress tourism. Let us not forget that the very idea of congresses originated in ancient Greece, with the Delphic Amphictionies. Conference centers in modern Greece have recently seen a spectacular improvement hosting in the past few years it has held major international events with complete success. Major infrastructure projects, such as the Eleftherios Venizelos international airport β one of the largest and most modern world wide β the Rion-Antirrion bridge, major highways, new sport centers and stadiums, the continuous creation of major congress and cultural centers, such as the metropolitan congress center in Athens soon to open at the Taekwondo Center on the coastal zone of the Greek capital in 2009. 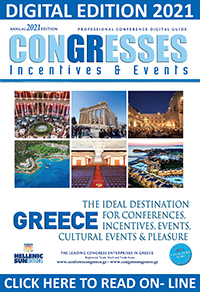 Furthermore, with a plethora of luxury hotels boasting conference halls and experienced conference organizers, Greece aims high within the competitive congress market and it daily improves its position, proving that it constitutes an ideal choice and destination for congresses, conference, incentive travel and major international sport and art performances. The local conference and cultural centers rate high among the best organized and equipped, located at the most popular destinations in our country, such as Athens, Thessaloniki, Crete, Rhodes, Kos, Chalkidiki, Corfu, the islands and throughout Greece, a guarantee for the success of your events. POLIS THESSALONIKI CONVENTION CENTRE S.A.